The farm is Pasture For Life certified. Every animal is reared under free range practices, on pasture their entire lives and only fed a natural diet. The cattle and sheep are 100% grass fed and grain free and the Pigs are fed a bespoke organic mix of daily essentials. No pesticides, herbicides or fertilisers are used on the land meaning that the land is truly maintained by man and beast producing a far superior quality product that also has a net positive impact on the environment - Maria and Mike truly farm from the heart. If there is one single root cause for how and why we do what we do now, it has to be Nanny Sage, otherwise known as mother nature. Instilled in all of us from a very early age was the idea to be curious, compassionate and to love and respect your surroundings. Sadly Nanny Sage is no longer with us but her love for the outdoors, nature and animal welfare lives on in Coxtie Green Farm. Back in 2011, Mike and Maria acquired Coxtie Green Farm, vowing to restore it to it’s former glory - the ex-dairy works had been left untouched and the fields derelict for over 15 years. The farmhouse was a mess, there wasn’t a roof in sight and the livestock, non-existent. However, the farm had become a blank canvas and a beautiful landscape with a natural ravine and running stream, waiting to be chiseled into a masterpiece. 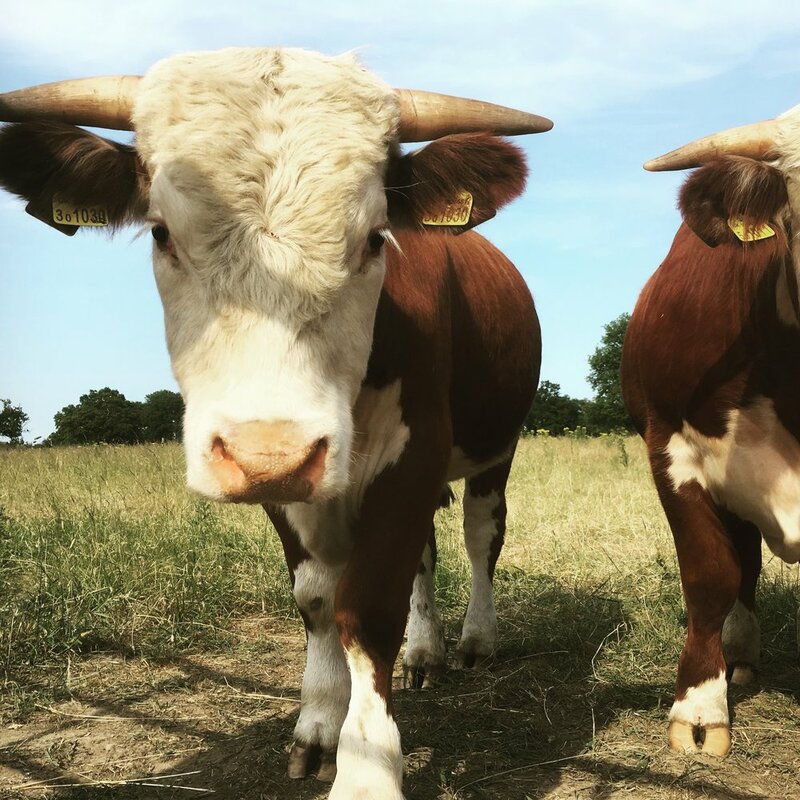 Fast forward to the present day where the farm has a herd of Traditional Pedigree Hereford Cattle, flock of Southdown and Easycare Sheep, Berkshire Pigs and Kelly Bronze Turkeys at Christmas time. Over the past 8 years Maria has turned a barren landscape into a working farm alongside the natural environment thriving. At the heart of the farm is animal welfare. Everything comes second to creating an environment that is conducive to the best possible life - one that has minimal human touch points and is as nature intended it to be. Over the years these traditional and morally-right principles have given way to a commercial, money focused mindset - to that we say, no more! Every day our livestock eat, sleep and breathe in harmony with their surroundings. Over the last 8 years there has been a true effort between man and beast to cultivate a landscape that is as nature would have it. No fertilisers, herbicides or pesticides are used to increase our yield, everything comes from working in tandem with the ecosystem. We want everyone that comes into contact with the farm to feel that it belongs to all of us, without you it would not be anywhere near where it is. This is a lifestyle that we truly adore and something that we hope enthuses many of you. To that end, we are entirely transparent in what goes on and how the farm works. We are always happy to take time out and conduct farm visits, nothing is hidden in the shadows.